On your next visit to the great outdoors, indulge in a relaxing hobby -the study and observation of birds! A popular pastime, bird-watching can have a soothing effect on your mind and may just be the break you are looking for. So grab your binoculars and get started right away to these bird-watching sanctuaries, Located in Kabini. It is a quick getaway from the city of Bangalore. Kabini is 200 odd km from Bangalore and can be reached in 3-4 hours. It is a small hamlet which is in the Kodagu district, and one of the top places to see in Kabini is bird-watching spots on the river. It is situated alongside the banks of the river Kabini which is a tributary of the river Cauvery. There are many wonderful spots to witness beautiful species of both migratory and local birds. One of the most famous national parks in Karnataka. Nagarahole National Park is located to the north west of Karnataka, is the best bird watching in Kabini. The two parks are separated by the river Kabini and is located in the Kodagu district of Karnataka renowned for coffee plantations and beautiful weather. Nagarhole National Park is a great place to visit with fellow bird watchers to witness over 250 variety of birds both migratory and domestic in nature. On any given occasion some of the most commonly sighted birds in Nagarhole are blue-bearded bee-eater, Malabar whistling thrush, Indian reed, Malabar trogon, Changeable Hawk Eagle, Malabar pied-hornbill, Common Hawk Cuckoo, Indian Roller, Woodpeckers to name a few. Located off NH-67 highway, Bandipur National Park is one of the biggest parks in Karnataka which offer a wide variety of flora and fauna. The park is around 70 km from Kabini and can be reached in an hour or so by road. There are many resorts in Kabini which visitors can stay in and set out to explore Bandipur during the day on safari. For bird watchers, this park is a paradise as it includes the elusive Osprey and Changeable hawk-eagle. The thick green forest foliage offers the perfect spots for many birds to nest and breed. This mountainous range is in Chikmagalur district of Karnataka and can be reached by road from Kabini in 3-4 hours. Lush green mountains and fantastic weather bless the region making it a great home for many migratory and local birds. Bird watchers head to this National park to watch rare birds such as the Imperial Pigeon, Great Pied Hornbill, and Malabar Trogon. There are as many as 200 species of birds here. A protected wildlife region in Mandya district of Karnataka, the Cauvery river passes through this wildlife sanctuary. It is located around 5 hours from the Kabini river and is home to tigers, elephants, leopards and wild boars. Apart from this, there are many species of birds which call this sanctuary their home including greater spotted eagle, white-rumped vulture, yellow-throated bulbul. This sanctuary is a wonderful day trip for those who love to get away from the hustle and bustle of a city. Step off the usual trails and find the hard to see Rufous-bellied Hawk-eagle in this beautiful location near Kabini. One of the best things about bird-watching is that it is an activity that can be carried out in solitude or in a group. It is a passion to watch these beautiful creatures in their natural habitat, especially the Rufous-bellied Hawk-eagle. The Biligiri hills are located south-east of Karnataka and is a day’s journey from Bangalore. These majestic hills are virgin hills and have dark, dense forests home to many animals and birds. The Gudavi Bird Sanctuary is in the Sagara district of Karnataka and is a day’s journey from Kabini. If you have stayed in one of the quiet resorts in Kabini, you can make a trip to Gudavi Bird Sanctuary to see the resident waterfowl. These birds are also migratory in nature and watching them fish, make a nest is simply beautiful. The little sanctuary is well preserved and surrounded by agricultural fields and dense forests. A small sanctuary located in Uttar Karnataka and is a day’s journey from Kabini. The small river sanctuary is well maintained and for those looking for a quieter spot to watch birds must visit this sanctuary. It is home to Indian and little Cormorants, barn swallow, black-headed ibis, Eurasian spoonbill and many other species of birds. The largest bird sanctuary in the State of Karnataka, bird lovers cannot give this one a miss. It is famously known as ‘Pakshi Kashi’ or ‘Bird Paradise’, and it well deserves that title as it is home to 170 species of birds. It comprises of 6 islets on the banks of the river Cauvery and is in the Mandya District. 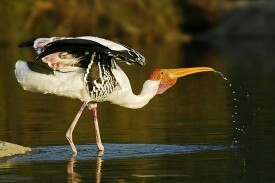 The painted stork is one of the most commonly frequented visitors to this bird paradise, and more than 3 lakh visitors come every year to see these birds in action. Apart from this, there are also Pelicans, kingfishers, open-billed storks in huge numbers that come to the sanctuary every year. The river Kabini provides the right amount of nutrition for many freshwater birds to thrive in leading to a dense bird population alongside the river. Another popular location for bird lovers which a day journey from Kabini is home to Grey Hornbill, Black-headed Oriole, Malabar Pied Hornbill, Great Indian Hornbill, Racket-tailed Drongo, Black-naped Monarch and others. This little sanctuary is located in the Udupi district and is one of those offbeat spots for bird-watching. Witness majestic birds in action undisturbed in Mookambika Wildlife Sanctuary.